A scene from Strauss' Elektra at San Francisco Opera, with Alfred Walker (Orest). Photo: Cory Weaver. Bass-baritone Alfred Walker spends his stage time in enviable roles, like Kurwenal (Tristan und Isole), Méphistophélès (La damnation de Faust), and the title roles in Der fliegende Holländer, Bluebeard’s Castle, Porgy and Bess, and Massenet’s Don Quichotte. 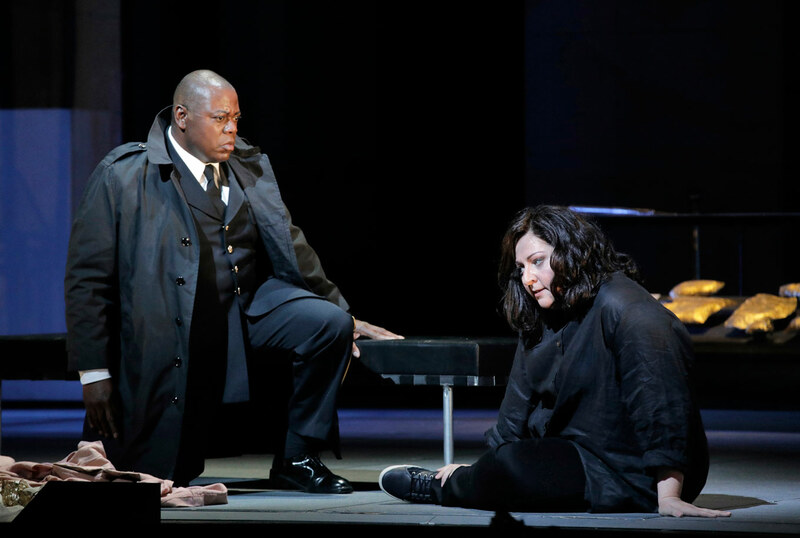 This month Walker is onstage with San Francisco Opera, singing Orest in Keith Warner’s production of Elektra, opposite Christine Goerke in the title role. It was a treat to chat with Walker about the unique patience involved in being a low-voiced male in the opera industry, and his offstage love of golf. Singing is my most effective way of expressing thoughts and feelings. It’s very gratifying to show the audience who you are. To show them real expression. Some artists have an instrument, some have pen and paper. I have a voice! What kind of man is Orest in Elektra? Are there any common misconceptions about his character? Orest is a man with a huge weight on his shoulders. Imagine being charged with the task of murdering your mother and her husband to avenge your father. That’s a tough assignment! He’s been training for this for most of his life and still hesitates. He’s a good man with a difficult task to complete. Not a killer by nature. Not sure if this is a misconception about Orest but it’s important to remember that Orest is Elektra’s baby brother. Orest was quite young when his father was murdered and was taken away from the house when he was just a boy. This could also explain his hesitation. He’s not as bloodthirsty as Elektra because he didn’t experience the negative events so vividly. A scene from Strauss’ Elektra at San Francisco Opera, with Alfred Walker (Orest) and Christine Goerke (Elektra). Photo: Cory Weaver. What advice do you have for young, low-voiced men, who may have to be more patient than others for their career to gain momentum? It’s really difficult to predict what a young low voice will turn into when it matures. How big will it get? What color will it produce when it’s in full bloom and maturity? My advice to young low voices is to stay active. There are many smaller low voiced roles in almost every opera. Sing them! Bend the ear of established colleagues…watch conductors in rehearsal…pay attention to problem solving onstage! Lower voices need more time. Use that time to prepare! How do you stay healthy and sane while on the road for work? Golf! I love to golf! It keeps me healthy and sane because it provides good exercise while allowing my mind to shut off. I have a good network of golf buddies and they often come out to visit me and play on the road. I’m very grateful to have them. What do you know about the singing career now, that you wish you knew 10 years ago? Artistry is about the journey, not the destination. I wish I’d known this 10 years ago. Elektra runs at San Francisco Opera from September 9-27. For details and ticket information, follow our box office links below.